Easily trim around landscaping, clearing away weeds and tall grass for a pristine lawn. With this string trimmer, the straight shaft design extends into hard-to-reach corners and under shrubbery. The powerful 27cc, 20cycle engine tackles tougher trimming jobs with ease while minimizing vibration. Perfectly balanced with a dual-line large bump feed trimmer head, this weed wacker is comfortable to use, easy-to-maneuver and simple to maintain. Plus, the drill assisted electric start makes getting to work easier and less of a hassle. Drill bit chuck included in packaging. Powerful 27cc full crank, high output engine to tackle tough trimming jobs. Easy line replacement with a large dual-line bump feed head. Get a precision cut from the straight shaft gas string trimmer's 17" cutting path with 0.095" dual cutting line. 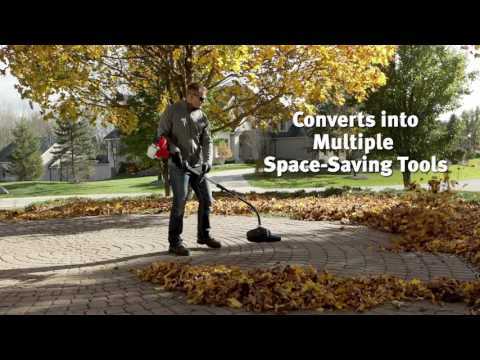 ClickLink® Universal Attachment System provides you with the option to add on universal attachments such as a leaf blower (sold separately) to extend the use of your straight shaft gas string trimmer. Ergonomic overmolded handle allows for comfortable operation.